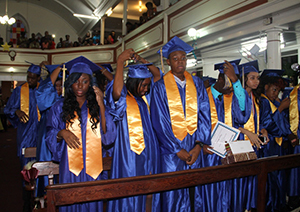 NIA CHARLESTOWN NEVIS (November 17, 2014) — Valedictorian of the Charlestown Secondary School (CSS)’s Graduating Class of 2014 Brianna Brantley, told her fellow graduands that they should strive to be symbols of their school, even as they parted the halls of the learning institution. 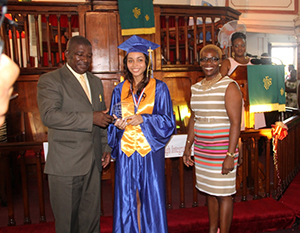 She made the call as she congratulated her fellow graduands and their families, when she delivered the valedictory speech at the Charlestown Secondary School and the Nevis Sixth Form College Graduation Ceremony at the Charlestown Methodist Church on November 12, 2014. A total of 128 students graduated. “Graduating from the Charlestown Secondary School today does not mean we no longer represent the school. I challenge us to always be symbols of the Charlestown Secondary School; symbols of Industry and Virtue,” she said. Brantley challenged the students to go on and become useful members of the society. “A good citizen is a useful member of society. I therefore challenge each of us to use our personal achievements today and all our tomorrows to not only become personally successful but to give back to the community that made it all possible,” she said. She also encouraged them to also think outside the box. “Don’t be afraid to be the crazy one. 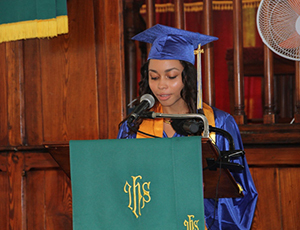 I challenge each of us to think differently, as many before us have,” the CSS 2014 Valedictorian said. Ms. Brantley also asked her fellow graduands to strive for success in their future endeavours. “As we look towards tomorrow, we do not know what it will bring. It is often stated that, ‘manners take you around the world’. However, I believe that manners, a good character and education are all necessary for success,” she said. However, she admitted some young people did not value good manners, a good character and education and offered advice to the graduates and other students who would follow in their footsteps. “As far as possible without surrender be on good terms with all persons. Strive for high ideals; and be yourself,” she said. Brantley also thanked the teachers, guidance counsellors and parents on behalf of the CSS Graduating Class of 2014.